I'm feeling much better, thank you. If you've ever suffered from an abscessed tooth, you know what your dog is going through. The abscess forms as a result of bacteria getting into the root canal, usually because the tooth broke or was otherwise damaged. Inspect your dog's teeth regularly for any sign of damage. 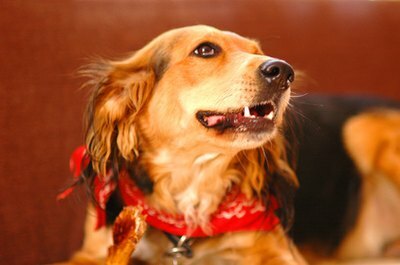 Dogs with abscessing teeth are in pain, so you should easily be able to tell that something is wrong. His breath might stink, he may not eat because of pain, his nose and mouth might swell up. Your dog may paw at his face, or start drooling, with drool containing blood. If he lets you, examine his mouth. You might notice a broken tooth. Other signs of tooth abscess include inflamed gums, with pus underneath the gum line. Depending on which tooth abscesses, your dog may appear to have an eye infection. Take your dog to the vet as soon as possible if you suspect a tooth abscess. Not only do you want him well again, but if bacteria enter his bloodstream from the abscess it can cause infection in his body. The vet will examine his mouth and, if an abscessed tooth is the problem, generally diagnose it pretty quickly. She may take an X-ray of the mouth and prescribe antibiotics to combat infection and ease pain. Your vet will also take a blood sample just in case a more serious medical condition, such as diabetes, is causing the abscess. The simplest treatment consists of tooth removal. It's possible that the tooth can be saved via a root canal, which is what your dentist would do if your tooth abscessed. A root canal requires more intensive surgery on the part of the vet and greater followup care, as well as expense. Whether a root canal remains a viable option depends on the tooth's condition and that of the surrounding mouth tissues, along with your willingness to pay for the procedure. If your dog undergoes a root canal, he'll need regular X-rays to check the condition of the tooth. If the tooth is removed, the vet will prescribe pain medications and antibiotics for a specific period. Your dog might need a dietary adjustment for a while, eating softer food instead of kibble. When he heals from the surgery, life and food will go back to normal. Do Greenies Treats Help Cats Breath & Plaque? Is a Root Canal Best for a Cat's Broken Tooth? Do Cats Drool While Stressed?